Another win! And again at an international level. We’re pleased to announce that Resolute has been named the bronze winner in the most socially or environmentally responsible company of the year category of the Best in Biz Awards 2015 International. Now in its third year, Best in Biz Awards International has retained its unique status of being the only global business awards program judged solely by members of the press and industry analysts. Having researched and covered numerous successful companies, they believe these judges have the expertise to objectively evaluate the entry pool to choose the top companies, teams, executives and products from among the submissions. Winners of Best in Biz Awards 2015 International were determined based on scoring from a panel of 26 judges drawn from top-tier news, business, finance, and technology publications and media outlets from 19 countries, with all continents represented. This year’s judging panel included writers and contributors to such publications as ARD (Germany), Asian Power (Singapore), BBC Radio (United Kingdom), Bennett Business Connections (Canada), CTV (Canada), J Arnold & Associates (Canada), MediaPost (United States), The Engaging Brand (United Kingdom), Vancouver Sun (Canada), Ventures Africa and many others. 2014 International winners, from 30 countries, included BlackBerry, Dell, Epson, DHL (New Zealand), Lenovo, Royal Bank of Scotland (UK), SDL (UK), Toshiba, Yealands Estate Wines (New Zealand) and more. The 2015 award winners were officially announced today. Best in Biz is just the latest in a long string of organizations around the world recognizing our company’s commitment to balancing the three pillars of sustainability – environmental, social and economic. Just a few weeks ago, we were shortlisted for the prestigious Responsible Business Awards by Ethical Corporation in the Best Public Company and Best Business/NGO Partnership categories. This London (United Kingdom) based competition, now in its 6th year, celebrates responsible business practices and companies from around the world by highlighting excellence in sustainable business strategy, sustainability leadership and communication as well as innovation and a variety of other categories. 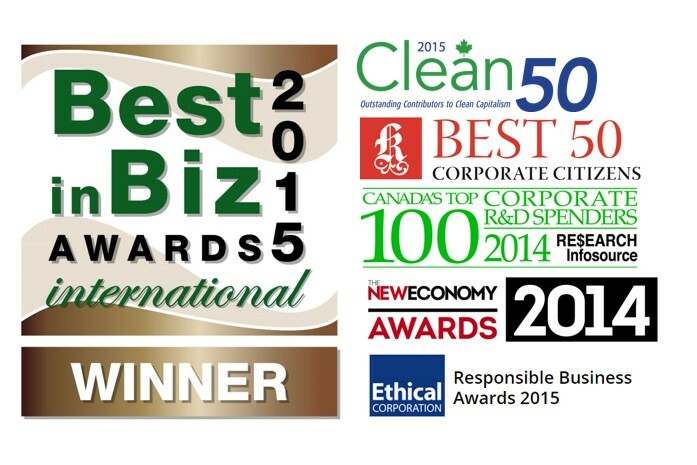 You also might recall that over the past year, that Resolute was ranked among the “Best 50 Corporate Citizens” in Canada by Corporate Knights and that Richard Garneau, Resolute’s president and chief executive officer, was named to Canada’s elite Clean50, recognizing leaders who have made the greatest contribution to sustainability and clean capitalism. The company was also named one of Canada’s top 100 corporate research and development spenders and followed that up with The New Economy magazine’s global Clean Tech award for best forestry and paper solutions. Overall, it’s amazing to be recognized for all of our hard work and dedication to sustainability. We’re proud of these achievements and excited to for what the future will bring.